jOOQ Newsletter: July 2, 2014 – jOOLY 20% Discount Offering – Java, SQL and jOOQ. Have you been evaluating jOOQ for a while now, still hesitating to purchase licenses? Or are you an existing customer and looking into licensing more workstations for your team? This is your chance! Get 20% off all your jOOQ purchases in the month of jOOLY 2014! Google has their summer of code, we have our month of jOOLY, where you get 20% off all your purchases for jOOQ Professional and Enterprise Edition licenses. Just enter the “jOOLY” discount code with your next purchase and start coding awesome Java / SQL code! Click here to download and buy jOOQ now! The discount code is only valid until the end of jOOLY (July 31, 2014), so act quickly! 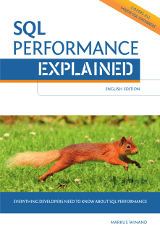 In fact, if you purchase jOOQ in the month of jOOLY (July), we’ll offer you a free PDF e-book copy of SQL Performance Explained with your purchase to help you get even more out of your jOOQ experience. “Henk”, who challenges the JavaEE folks to add jOOQ to the standards. It’s about time! @brunoborges @edburns "giving up of JPA because a possible NoSQL" OR adding both jOOQ and JDO to Java EE? Chris Raastad, who … well. Who puts it bluntly and is looking forward to use the “last missing features” from .NET also in Java. We’re honoured to be compared to LINQ. Thanks Chris! Speaking of LINQ, you may have heard of JINQ. JINQ now also has a jOOQ integration, allowing you to query the awesome the Java 8 Streams API as if it were a database. With jOOQ being the backing SQL implementation, you get all the advantages like typesafety, SQL transformation and standardisation, etc. So, let’s hear it for Dr. Ming-Yee Iu, from whom we’ll certainly hear more in the near future. Instil Software from Belfast is hosting this great jOOQ and Flyway workshop on July 16, 2014. “Unfortunately,” it is already sold out, but we’re sure that this killer productivity combination will be interesting for numerous future workshops. If you’re missing out on it, read this blog post to get an overview of jOOQ and Flyway. If you’re hosting such a workshop yourself, let us know. We’ll be more than happy to advertise it in our events section of the jOOQ website. If you haven’t seen it already, consider reading the ZeroTurnaround Java Tools and Technologies Landscape for 2014, a survey of 2164 Java professionals (slightly biased towards ZeroTurnaround’s RebelLabs audience). jOOQ is listed and compared to other Java / SQL integration patterns. We’re clearly catching up with well-established brands like MyBatis – so stay tuned for more community news as we keep growing. You’ve read to the end of this newsletter, that’s great! Did you like it? What did we do great? What can we improve? What other subjects would you like us to cover? We’d love to hear from you, so if you want to reach out to us, just drop a message to contact@datageekery.com. Looking forward to hearing from you!